Cover of Larry Baker's new book. Iowa author Larry Baker has released a sequel of sorts for his popular first book “The Flamingo Rising” that was released in 1998 and later made into a Hallmark movie. 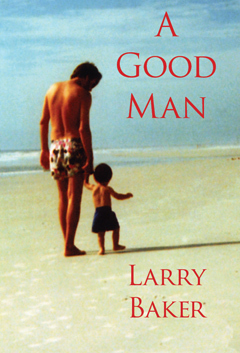 The new book “A Good Man” is actually Baker’s third, as his second didn’t make as big a splash as the first. Baker admits generating continued interest isn’t easy. He says he started to write a book about radio talk show hosts and fake preachers and found that some of the characters were like the characters in the first book. So Baker says he updated the characters and put them in a new story. The main character in the new book is on the radio. Baker says the man works the 10 p.m. to 2 a.m. shift and is convinced that nobody is listening to him and starts to get burned out. He retreats into old books and poetry and finds out he has a cult following. Baker says he got inspiration for the book from Harry Chapin’s song “W-O-L-D” about a radio d-j. Baker lives in Iowa City. You can find out more about the book and Baker at: www.redroom.com/author/larry-baker. He will be making several appearances to promote the book. They are: November 5th,-Book Vault in Oskaloosa; November 19, Prairie Lights in Iowa City, November 19, Wild Rose Books at U-I Hospital (noon); December 17, Barnes and Noble in Coralville (7 pm); December 19, Hoover Library in West Branch (noon).